Speaking for myself, I own four (4) gaming mats (Space, Sea, Desert and Urban). So I was wondering if any company produces a gaming mat that has a Great War trench system and no-mans-land on it for say 15mm to 20mm games? I look forward to your help. I noticed the Wings of Glory trench mat, but those trench were way too small for figures. I hope some one here knows of some others. Beanie, you'll need to give people ground scale to get results. 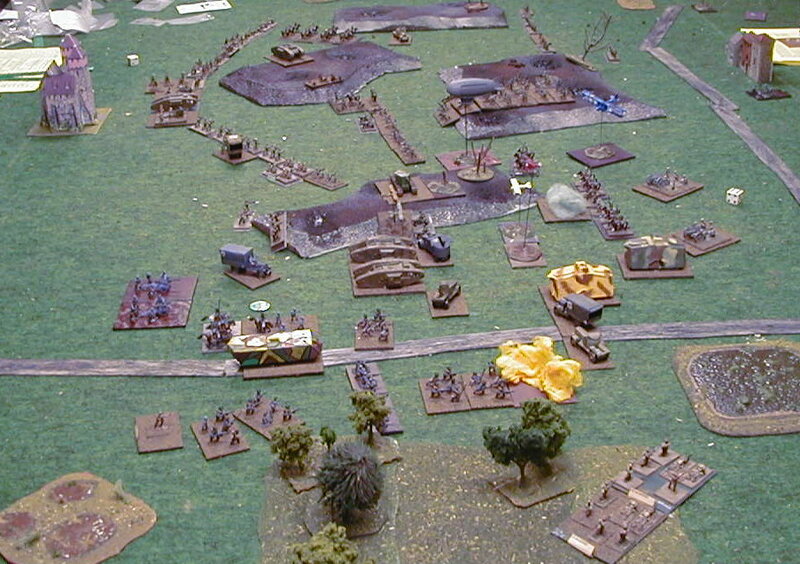 No man's land for 1:1 skirmish is a little wider than it will be for 16 figures to the battalion. Similar things happen to the trench system. But if I were you, I'd buy brown felt and paint. I am pretty sure Cigar Box makes one, or a close version of one, like a no man's land or such. I would make a trench system otherwise it remains the exact same from game to game. Don't use felt it always looks like crap in my opinion. Use cotton, It's thinner and takes paint great. Canvass sprayed with paint can look good. I disagree with Extra Crispy on the use of felt. If you sprinkle generous amounts of woodlands scenics flock, you can produce a very nice looking terrain effect. I did this for years before I went with a game mat. I set my great war game in the summer of 1918, with the armies fighting more in the open than no mans land which made for a more interesting game. I made some terrain pieces from foam, with craters made by hairdryer, all painted shades of brown. If I were doing a whole battlefield of no man's land, I would get thin insulation board, make craters and rough it up, dig trenches on either side, paint various shades of brown and use it. A local club member custom made the terrain for WWI. He just got a thick piece of pink foam from Lowes or Home Depot. Used a cheap hot cutting wire to cut out the trenches or I guess you could use a router. Some paint and woodlands scenics flock and bam, you had a WWI battlefield. The biggest downside is storing it between games. I prefer 1914-15. More of a mobile war. No trenches and you have cavalry.